It started out like any other gathering in SE Portland: A motely crew of people hanging out on the porch, lingering on the stoop. Overgrown shrubs and flowers spilled onto the sidewalk. But this was no ordinary gathering. We were here to do a little work and celebrate the beginning of the end. 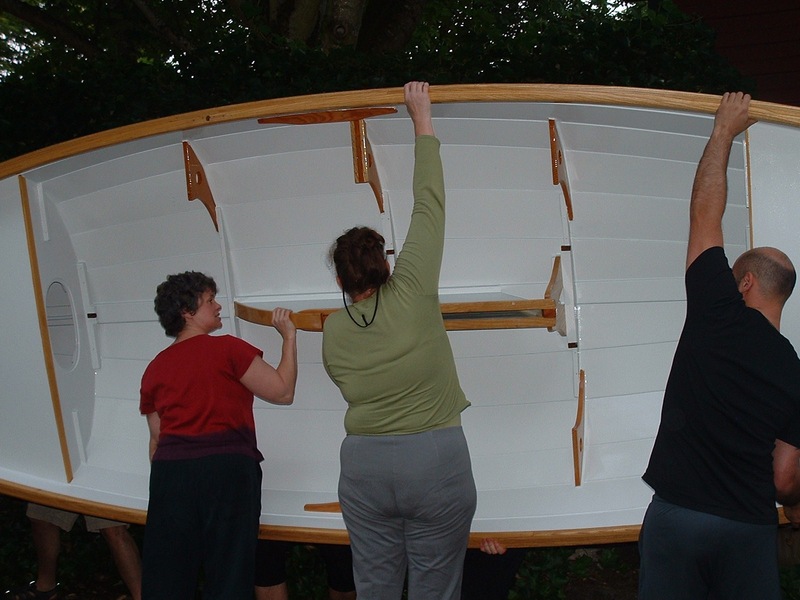 That is, we were preparing to turn the hull of my boat over so that the bottom could get its final coats of paint. From there, just a few hours of work and we’d be ready to rig her up and get out on the water. Ex-midwife and family friend, Rhonda, arrived first with her husband Randy ready for lifting action in a homemade muscle shirt. Next to turn up were sailors Mike and Allison who can commonly be found racing small boats. “This looks like one of those Portlandia neighborhoods,” said Mike surveying my neighbor’s decomposing porch and flamboyant flower display. Seconds later Andy Bike on his cargo bike and Ms. Bike on her stylish lady’s Rivendell rolled up the driveway with their two kids in tow. My son rounded up Josh the chef, just returning home from a long shift behind the stove. While we were waiting for another neighbor to arrive, a muscly, tattooed guy walking a tiny dog ambled down the sidewalk. He noticed Mike’s Thistle sailboat shirt and it soon came out that a fellow sailor was among us. We shortly shanghaied him for the cause. “How much does this thing weigh?” queried a doubter. 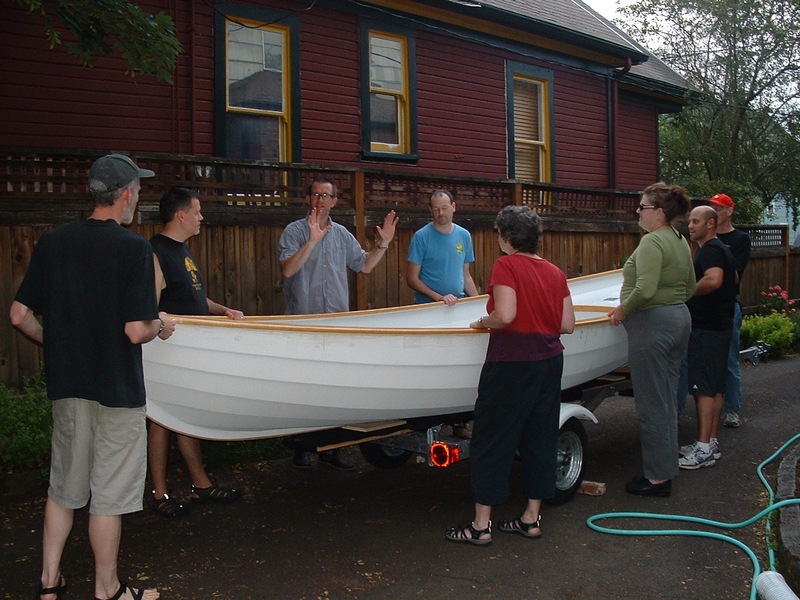 Surveying the 18 foot boat I sheepishly replied, “Um, I don’t know, that’s why I invited so many of you to help,” I suddenly felt less like a leader than a knee-high kid looking up at a group of adults. 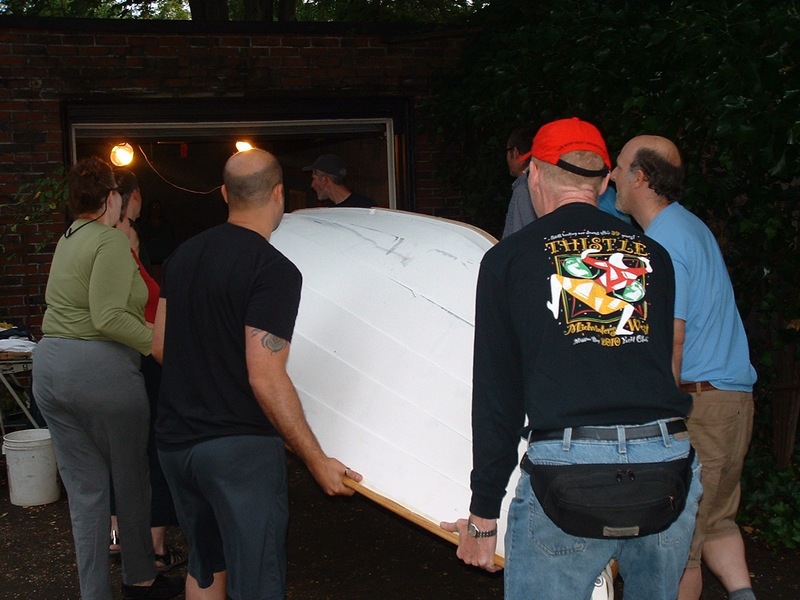 This didn’t last long, as once the crew grabbed the gunwale we were all surprised to find the boat surprisingly light. Within a few moments of deciding on a plan, the boat was being heaved up and was rapidly 90 degrees out of it’s normal position. It loomed over the group like a breaking wave. For an intense second, my brain imagined the sickening sound of wood being crushed under pressure, but before that could happen, the boat completed its rotation. Small boys scurried underfoot, adjusting the sawhorses to just the right locations, the boat was set down without incident, and all involved cheered. We turned off the lights in the shipyard, I mean garage, and off we went to celebrate.